School groups are easily catered for during the summer as we use Croyde Beach and the Academy of Beach Sports area, which has six beach volleyball courts as well as a beach soccer pitch through May to September. 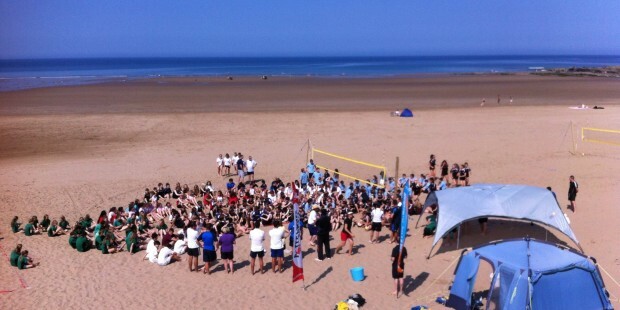 We can organise both or either coaching and competitions, summer 2014 saw Denise alongside the Beach Academy organise the Devon Schools Beach Volleyball Championships with 248 players competing in 124 teams across six divisions on 24 courts. We also cater for primary school age with the adapted version for KS2 of Volleysport, every year we host the Braunton Feeder primary schools with 96 teams and 192 children under 11. We also have two sheltered beach courts on Croyde Village Green, in case of bad weather and high winds. For smaller coaching groups. Rates are charged by the hour for the coaches for large school groups price will depend on the number of students and number of hours. For visits to your school to run volleysport activity sessions, with full lesson plans and net wall principles to hit all ofsted targets please contact us.